Tell me if this sounds familiar: You make your to do list for the day and as you’re looking at it you realize you have 24 million things to do. You start feeling overwhelmed, maybe a bit of anxiety kicks in. You decide to just start doing things. The end of the day comes and you’ve done a lot of things, but you realize you’re not any closer to meeting your goals than at the beginning of the day when nothing was done. It was for me, for a long time. It was only after years of frustration from doing everything and going nowhere that I realized it’s not the amount of things you get done each day, it’s getting the essential done that matters. After I learned this lesson I started doing LESS each day and at the same time saw myself advancing toward my goals much quicker than when I was working so hard doing so many things. So, how do you know what is essential? How do you decide what the important things are? Glad you asked. Here are some simple steps to define the essential and increase your productivity. Before you can decide what is essential to get done each day, you must set some goals around improving the areas in your life that matter most. I cannot overstate the importance of setting goals. Saying you want something is all fine and dandy, but if you don’t set a measurable goal around it, my guess is you’ll find yourself wanting the same thing this time next year. If you’re new to goal setting, no worries! 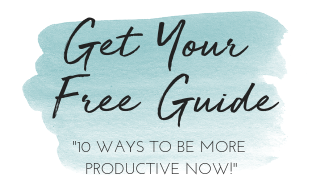 I have a free Goal Setting Package that you can download right here. This package will walk you through all the steps to set measurable and achievable goals. On a daily basis do a brain dump. This is really simple, get a pen and paper and write down every. single. thing. you think needs to get done. Take some time here and write down everything. After you complete your brain dump, start sorting these items into the following categories: things that align with your goals, things that have to get done—because life, and everything else. Anything that aligns with your goals or anything that has to get done, gets prioritized. Things in the “everything else” category go away. Once your list is made and prioritized, decide which items can be delegated or outsourced and do it. The goal here is to narrow your list to items that are within your Zone of Genius only. Tasks in your Zone of Genius require YOUR unique attention and expertise. Ladies, this step tends to be the hardest because we like to believe that we HAVE TO do all the things. This is one belief I want you to work on letting go of. You don’t need to do all the things because there are other people in the world that can do them. For example, you spouse our kids can do the laundry, you can hire a housekeeper, or you can hire a VA to do your social media graphics. The essential item is the top thing on your list of items within your Zone of Genius. Start with the top priority item and work your way down. On a daily basis this list should include no more than 3-5 things. **SPECIAL NOTE**Don’t allow yourself to do anything else until the number one item is completed. When I say nothing else, I mean nothing else. Until that number one item is done you don’t check email, you don’t check Facebook, and you don’t do other tasks. You do the number one thing on your list, first, each day. Once the number one thing is done, you can move to other things on your list or other daily recurring tasks. At the end of each day, or the beginning of the next day reflect on where you’re at and start the process over. This will help you stay aligned closely with your goals. It will also ensure that the tasks you’re completing each day are the necessary ones for success. Increased productivity-you’ll be doing the right things which is what productivity is all about. Forward progress toward meeting your goals. You’ll be completing the tasks that align with your goals which means you’ll move closer to meeting them. Ladies, focus on the essential, operate in your Zone of Genius only, and, I promise, you’ll find more joy in your life. Let me know…what is your Zone of Genius? What are the things that only you can do in your business and life? Drop them in the comments below.